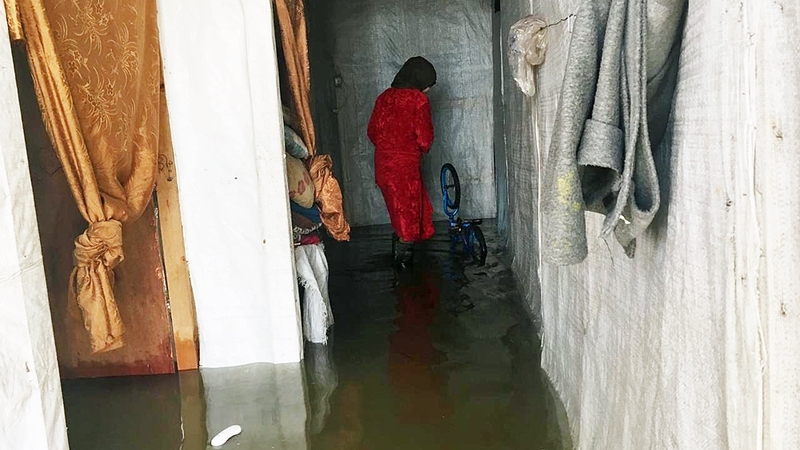 Bekaa Valley, Lebanon – Tarima Ibrahim huddled together with her children to keep them warm as incessant rainfall, heavy winds and hail slapped their tarpaulin tent and lashed their refugee camp. 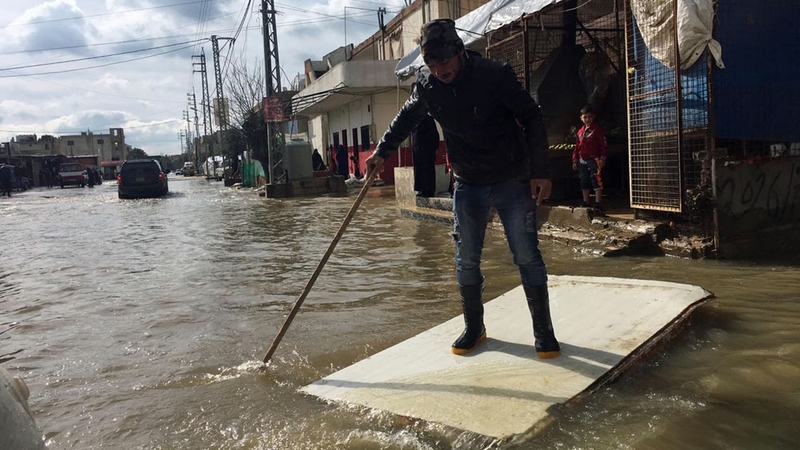 Lebanon was hit by Storm Norma on January 6, heavily impacting at least 360 informal refugee settlements and putting 850 others at risk. The country is home to more than a million Syrian refugees, many of whom live in temporary structures like these. 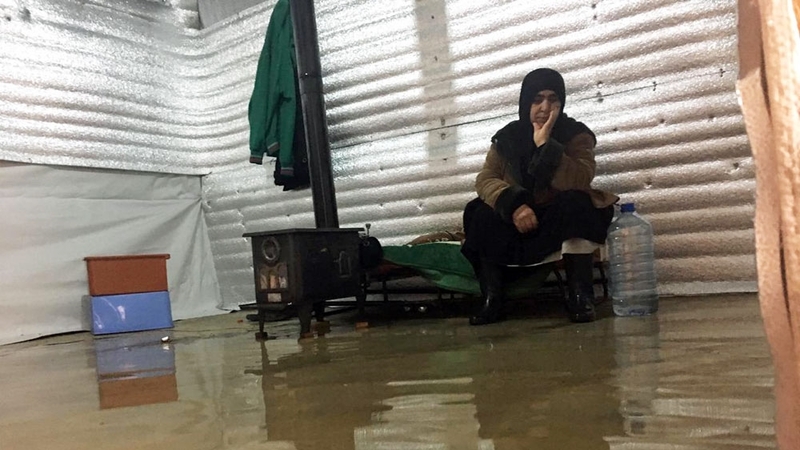 Tarima’s camp, Ali Askar, is situated near the snow-capped Qalamoun mountains, in an area called Bar Elias in Lebanon which is one of the worst hit by the storm. Wading through knee-deep water, Tarima pointed to the floating utensils, soaked jackets and dripping blankets in her tent. “We lost a home in Syria, now we have lost what we had here,” she said. In 2015, Tarima fled Homs in Syria and moved to the Bekaa Valley in Lebanon. She said that she may have saved her family from the war but does not know how to protect them from the wrath of nature. According to the United Nations refugee agency, UNHCR, at least 70,000 people are at risk from extreme weather, over half of them children. Norma has already claimed the life of its first victim, an eight-year-old girl who was swept away by the flood in the Minieh region. Tarima is frightened about losing her children to the storm. “I was afraid they would be swallowed by the flood, now I am worried about disease,” she said. Her 18-month-old boy Ahmad has been running a high fever for over a week now but has not yet seen a doctor. “There are no medicines and no doctors,” she said. “Look at this dirty water. Won’t there be sickness?” she added. Her other children have colds and coughs, a condition many children in the camp are suffering from. “There is not enough food either. My children have not had milk for over a week,” Tarima said, adding that she lost the food she had saved to the water and is now waiting for local Lebanese NGOs to provide whatever they can. Lisa Abou Khaled, a spokesperson for UNHCR, told Al Jazeera that the organisation has begun to pump out water in the camps in the Bekaa. She said it is “proving to be a challenging task” because most of the camps are built below road level and rainwater has continued to accumulate. “Both in the North and the Bekaa, alternative sites have been identified to accommodate families affected by the storm,” Abou Khaled said, adding that about 600 people had been relocated so far and some have moved into permanent structures with family and friends, while others have sought shelter in nearby schools or mosques. Lisa said that along with local authorities and partners, UNHCR has distributed blankets, mattresses, and drainage kits. The International Rescue Committee [IRC] has also sent its team to the affected areas and reported severe damage in the camps in North Lebanon. Paul Donohoe of the IRC said that their team visited the camps in the Akkar region and described the site as “looking more like a swimming pool”. “Irrigation and drainage at informal tented settlements are poor and it is almost impossible to prevent flood water entering the tents,” Donohoe said. IRC has suspended many of its educational activities in the country, affecting 5,700 students. Nadia Rdeini, a local activist, has been conducting many rounds of the Ali Askar camp. 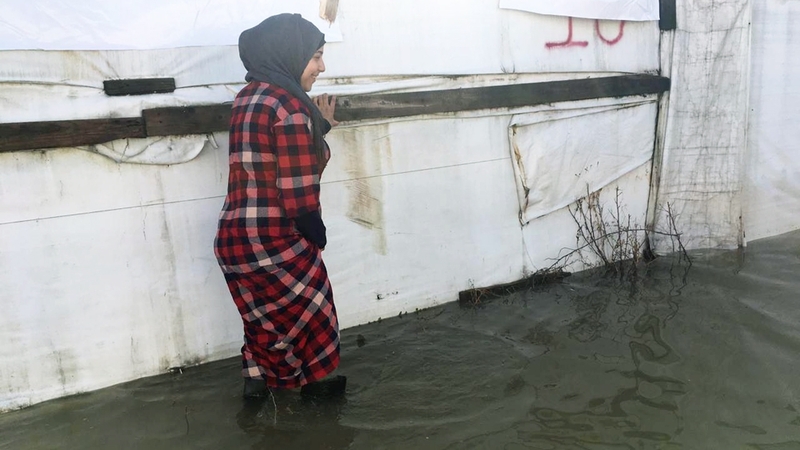 As the camp flooded, she said, the refugees were rushed to the centres run by two NGOs in the camp so they could be provided some immediate relief. But much more needs to be done. Nadia is concerned that the people may have to live with the aftermath long after the bad weather has passed. She volunteers with an NGO called Lighthouse Peace Initiative, which has started a fundraiser campaign to help the refugees in the Bekaa Valley. Another resident in the camp is Huda al Zahoori, whose tent is also flooded. She is in her late sixties and lives alone in the camp. Her husband left for Syria a few months ago when they heard that their son had been arrested by the Syrian government, she said. Huda’s sentiment resonated in other camps. The Syrian refugees said that they were tired of the living conditions in Lebanon even before the storm hit but could not see a way out. The Lebanese government has always said that they want the Syrian refugees to return to Syria and has done little to help those struck by the storm and in urgent need of help. On Thursday, Prime Minister designate Saad Hariri headed a meeting with a range of ministries and announced measures to mitigate the impact of another storm expected over the weekend. Lebanon’s National News Agency reported that government intends to clear up four storm drains located within Greater Beirut and repair damage on key roads. The Syrian refugee encampments though may continue to be inundated. Lebanon does not allow official refugee camps and has strict restrictions on material that can be used to build even semi-permanent structures, to prevent them becoming permanent. This has forced many Syrians to live in unprotected tents and brave harsh winters year after year. The Lebanese government fears that the Syrian refugees may never return and will stay back in Lebanon just as the Palestinians did who came here in 1948. On Wednesday, Lebanon’s President Michel Aoun said that the Syrians should go back to Syria, take part in the Syrian reconstruction and live with dignity. Tarima said that she does not want to say anything against the Lebanese government but she does not have any hopes from them. “We pray to our God that the waters recede,” she said. “But it would be very kind of you to ask someone to help us with water for the toilets. The bathrooms in the NGO centre are very dirty,” she added, as two boys rowed a plank of wood from one camp to another.